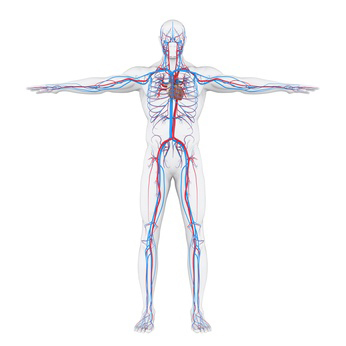 The veins in our legs have a crucial role to play in transporting the blood from our lower body back to the heart. The pumping capacity of our heart alone is not sufficient to ensure full circulation of our blood. In order to overcome gravity and push our blood back up our body to the heart, we have a calf muscle pump that pushes the blood through our veins back to the heart. The Americans call this calf muscle pump the ‘second heart’ as it works in tandem with the heart and its work is crucial for a healthy circulation. In an adult, the heart pumps about 6,000 to 8,000 litres of blood a day into the bloodstream, into the arteries. The same amount of blood has to be transported back to the heart by the veins, defying gravity in the process. The calf muscle pumps pushes the blood upwards through the veins while the venous valves prevent backflow and avoid the blood from flowing back down in the direction of gravity. All this happens at the same rhythm as the heart pumping blood downwards. The type IIa muscle fibres also play a crucial role here enabling the functional capability of the blood return system. In a healthy person who is able to walk, run, climb stairs and keep mobile, the calf muscle pump and the associated muscle fibres in the calves are kept strong and able to boost the vein function. But in someone who is very inactive the muscle pump and type IIa muscles fibres become weakened or compromised and circulatory disorders appear in the legs. Marodyne LiV improves circulation even after just a few minutes. The gentle vibrations activate the muscles and boost the supply of nutrients and oxygen to the type IIa muscle fibres and calf muscle pump. Ongoing, regular LIV treatment will strengthen the calf muscles and boost their ability to perform their ‘second heart’ function. Increasing circulation by using Marodyne LiV means that lymph and blood return can be vastly improved. One study showed blood return increased significantly in the lower thigh, pelvis and thorax areas (1) with vibration at a very low intensity of 15 Hz when compared to a control group not undergoing the treatment. Marodyne LiV is a physio-therapeutic treatment system where health-promoting movement stimuli from the vibrations are introduced into the body and skeleton. These stimuli positively influence the body in multiple ways: boosting blood circulation and the cardiovascular system; activating muscle fibres and bone cells which, in turn, strengthen muscles and build bones. The body responds to this stimulation resulting in increased strength, balance, vitality and mobility. Exercise promotes the body’s natural healing processes by boosting the supply of oxygen and nutrients to the cells: one of the most important prerequisites for pain relief. For people taking medication, for pain relief or other reasons, taking exercise is essential to ensure the circulation is good enough to transport the drugs, via the blood stream, around the body to reach the organs and tissues being targeted by the medication. As well as boosting the circulation, the gentle low intensity vibration helps metabolic processes and mobilises the cardiovascular system which must also work well to restore a sense of well-being. (1) Stewart J, Karman C, Montgomery L, McLeod K. (2005). American journal of physiology. Regulatory, integrative and comparative physiology. Plantar vibration improves leg fluid flow in perimenopausal women.